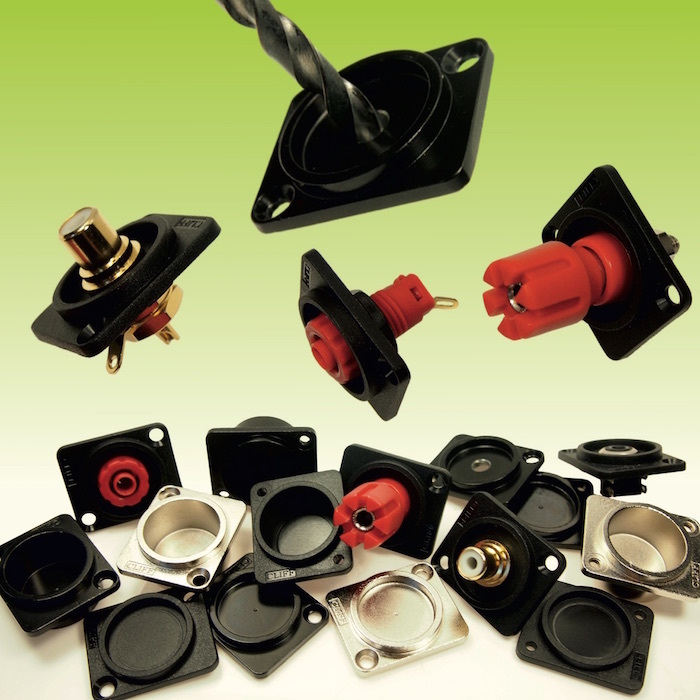 Read-out Instrumentation Signpost: Recessed socket plates. Cliff Electronics are now offering panel builders and system integrators a user customisable connectivity option. The new XRP Customisable Recessed Socket Plates continue to use the very popular XLR panel cut out and allow users to fit a connector of their choice or retro-fit a connecter to a system at a later time. This facility will be particularly useful for non-standard or more esoteric connectors not easily available from component suppliers. The blank XRP socket plate also allows for cables to be passed though using a grommet or cable gland and push buttons or LED indicators to be mounted. The Cliff XRP Customisable Recessed Socket Plates offer 3mm and 12mm recesses to accommodate low profile and deeper connection options. They are available in black plastic and nickel or black finished metal. All versions are available with countersunk or plain mounting holes and metal versions can be supplied with an M3 thread in the mounting hole. The new customisable recessed socket plates are provided with a drilling guide in the centre of the connector mounting area to ensure correct assembly. The new XRP customizable recessed socket plates can be mounted into the 19” rack panels provided by Cliff for users to configure or for factory assembly. John Hall, Managing Director of Cliff Electronics, comments; “Our range of XLR mounted standard and FT connectors is growing rapidly in both options and sales as customers continue to find new applications for them. There will always be requests for non-standard or very specialised connectors in quantities which may not be viable for us to manufacture. That’s why we have introduced the XRP Customisable Recessed Socket Plates which offer an XLR based mounting platform to which users can fit any connector or accessory they wish. Should the end application reach good sales volumes we will always consider putting it into production." This series of true, feed through, data connectors for electrical and electronic instrumentation are perfect for developing custom I/O configurations for wall plates, enclosures, rack panels, etc. All fit within a standard XLR panel cut-out and use common standard cabling for front and back connections with no soldering or screw terminal connections required. FT connectors may be mounted from the front or back of a panel and a low rear profile accommodates the tightest behind-the-panel spaces. Pre-assembled 19” rack panels fitted with a range of FT and standard connectors are available from Cliff to simplify end system assembly. Versions available include GJ45, HDMI, BNC and USB3.0 compliant single and dual USB versions in addition to the existing range which provides Analogue, Digital and Optical Feed-Through connectivity in formats including Firewire, HDMI A-A and metal or plastic 50 ohm BNC versions, USB2 A-to-B and B-to-A “gender change” sockets high speed USB Type – C, USB3 to USB3 in all gender changing configurations - A-A, A-B and B-A. Also available are all popular data and Ethernet connectors including USB 2.0 and 3.0, LC and SC fibre (Duplex & Simplex), UTP and FTP RJ45s in both Cat6 and Cat5e (shielded and unshielded), Toslink, RCA Phono and HDMI and blanking plates.